My daughter Lydia made Fruity Pebbles "Rice Krispies" Treats this evening. She was supervised of course. You will need the following to make yours! In a large sauce pan melt butter over low heat. Add marshmallows and stir until melted. Slowly add in your fruity pebbles. Make sure they are completely covered. Pour into a greased pan and allow to cool. Ours took 4 hours to settle and get hard. She added mini chocolate chips on half of them! Quick and kid friendly treat for the kiddos to make! Thanks for reading! 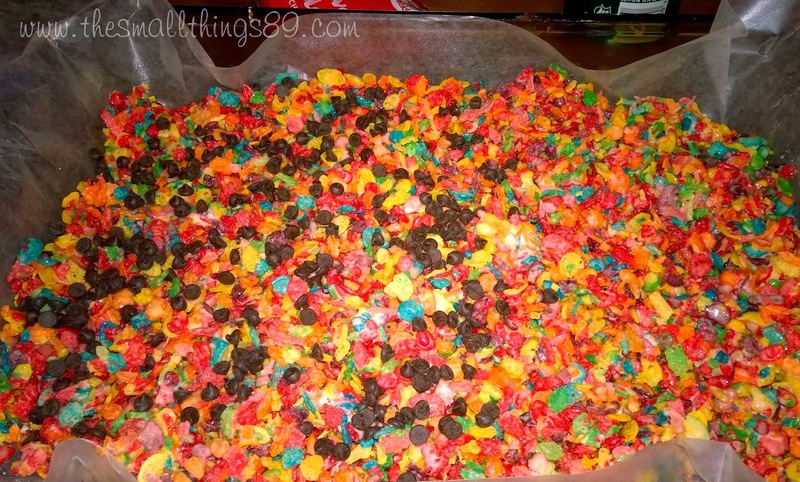 I have made Rice Krispie treats before but never thought about using Fruity Pebbles. I really think my grandkids would go for these. They look really yummy. I've never thought to use Fruity Pebbles! I love them...they sure have a lot of flavor, they just get soggy too fast. This is a much better way to enjoy them I think. I'll sure try it! Good job Lydia! These are so colorful and fun! I will have to make these with my son soon! These are such a great idea. My oldest daughter loves rice krispy treats and fruity pepples. I think she would love these. We also do these with cocoa pebbles and add peanut butter chips.